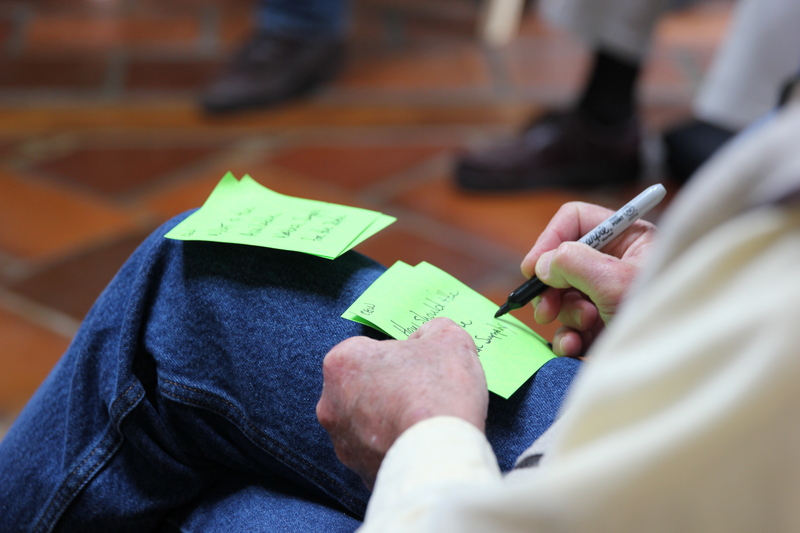 At their March gathering, participants in the Delta Dialogues facilitated and mapped the conversation for the first time, as they plotted a course for the future of the process. 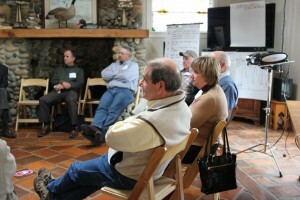 Participants, while lamenting low attendance during the gathering (just five stakeholder groups were represented), noted that it is an extraordinary busy spring for many involved in the Delta Dialogues, from efforts to combat drought and gathering public comments on the Bay Delta Conservation Plan consuming the time of participants. The consensus of the meeting was that by delaying the next meeting for a couple of months – and gathering in June, when things may be less busy for participants, would help the process. The participants in March also made progress in editing a letter by Dialogues participants to Gov. Brown – a letter that was first proposed at the February Dialogues gathering and then drafted by Nancy Ullrey of the Conservancy. After a few edits, participants said they would continue to communicate by email in hopes of finalizing a draft among participants who couldn’t attend the March meeting. “I think it’s a really nice letter,” added Carl Wilcox of the state Department of Fish and Wildlife. During the five-hour session, participants received a briefing on the Statewide Water Action Plan from Paul Marshall of the Department of Water Resources. 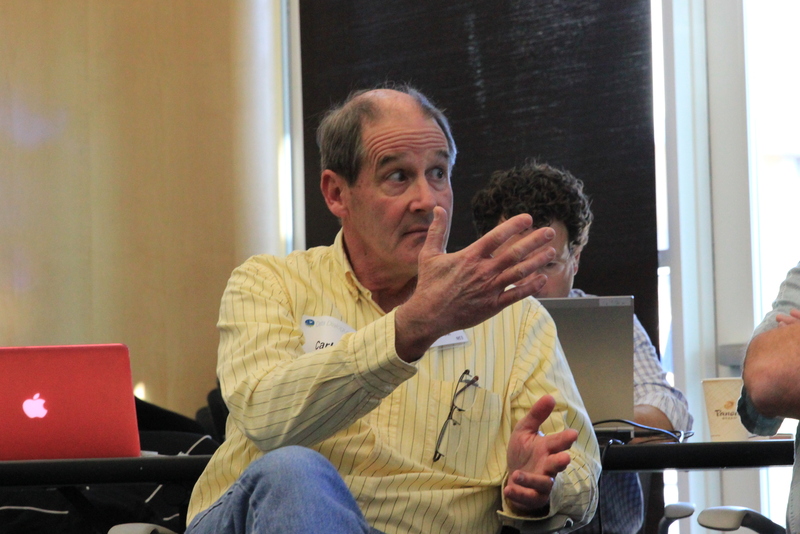 Marshall emphasized how, throughout California, individual water managers are siloed. In 50 of California’s 58 counties, he said, flood managers don’t interact with water supply managers. 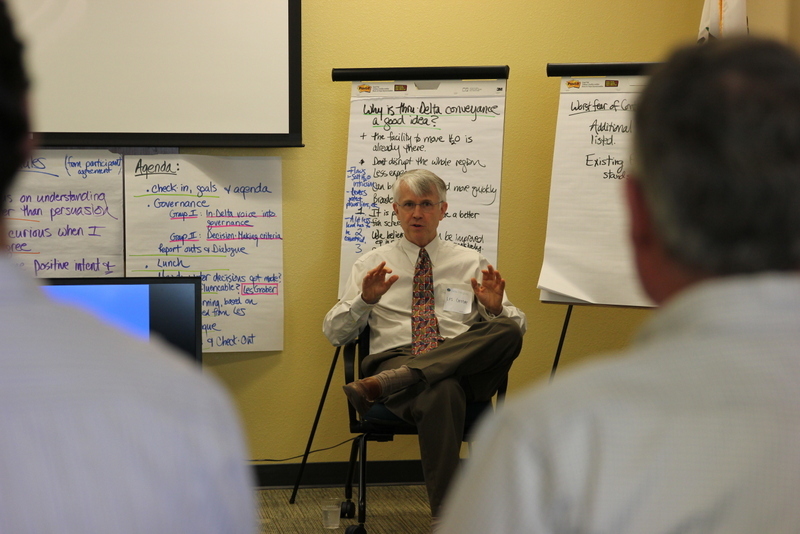 Marshall asked the group for ideas on how to better integrate the different people and parts of California’s water infrastructure. After lunch, the participants discussed in detail how to move the conversation in the Dialogues forward. Much of this planning for the future was about framing the right kinds of questions. 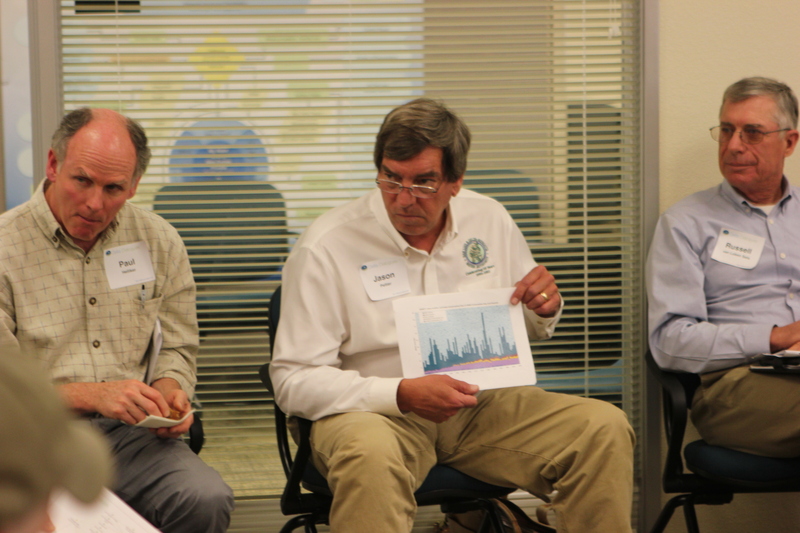 Should the participants talk about optimizing the water supply, as Delta landowner Tom Zuckerman has suggested? 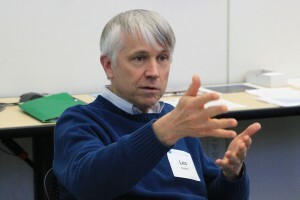 Should trust be the focus of future conversation, as van Loben Sels suggested? 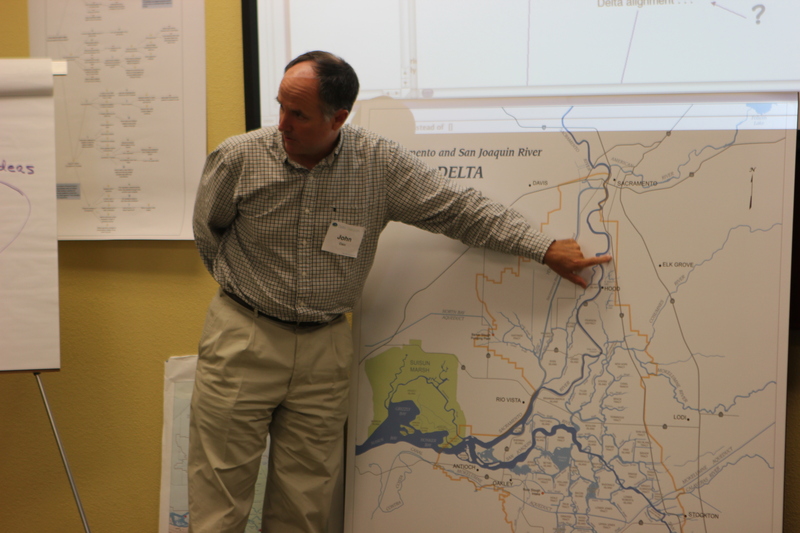 Can the group help make policy changes in the Delta, or in the BDCP? Participants expressed interest in both of these paths – water supply and policy changes – and reaffirmed the value of the Dialogues, even in a meeting with light attendance. 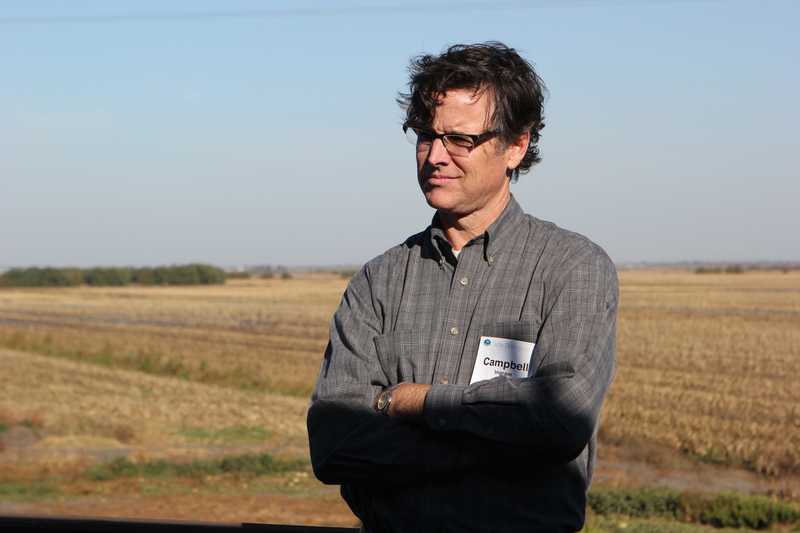 “I’ve been very happy this conversation has been as rich as it has,” said Campbell Ingram of the Delta Conservancy. Will the Delta Dialogues Send a Message? 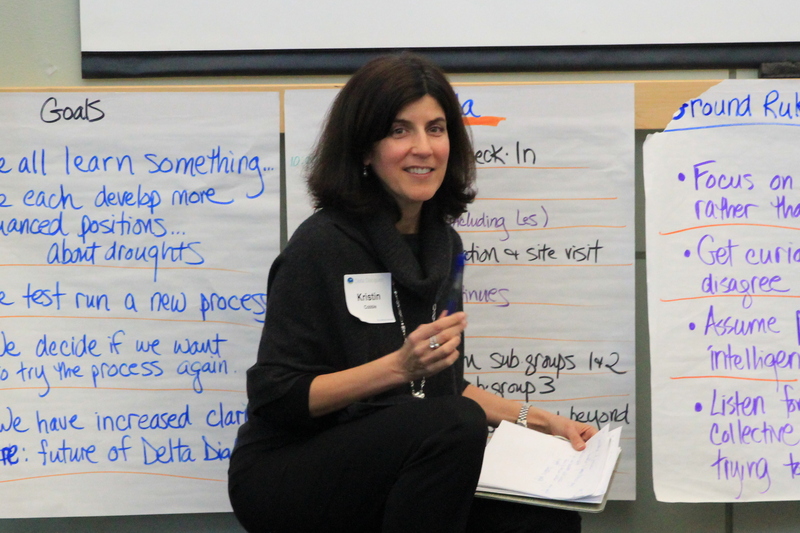 The Delta Dialogues entered a period of change with its February gathering, as the facilitation team departed and participants summed up their work and accomplishments in preparation for writing a letter to state leaders and the public. 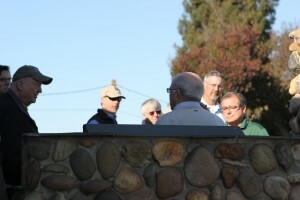 The change in the Delta Dialogues was apparent from the first minute of the February gathering, at Conaway Ranch in Woodland. Campbell Ingram of the Delta Conservancy stood at the front of the room, instead of facilitators Kristin Cobble and Jeff Conklin, who sat to either side. This would be the last meeting for the facilitators, because the funding to support their work has expired. The dialogues, Ingram explained, would continue along under the direction of the participants themselves. 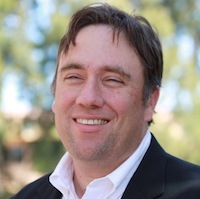 “We are in transition,” Ingram said. That introduction set up a daylong meeting during which the participants, representing a diverse group of stakeholders, took stock of the dialogues’ work so far, discussed how to tell the public about that work, and proposed questions to carry the Dialogues into the future. 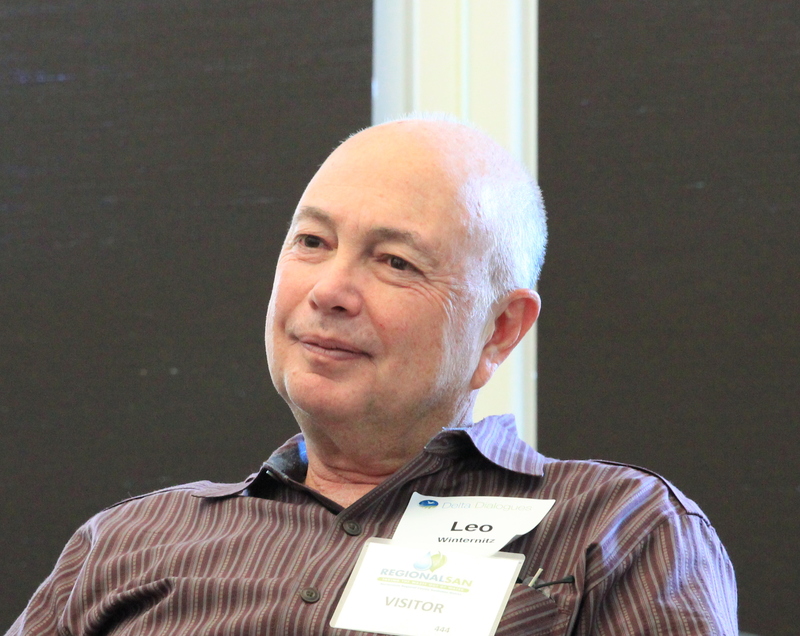 “What the Delta Dialogues has gone through in the last year and a half that’s very important in my mind is just proving that we can talk to each other in a civil manner,” said Leo Winternitz, who recently retired from the Nature Conservancy. After Ingram facilitated the first hour of the Dialogues – a preview of what he said would be three more meetings in the months to come — he turned the floor back over to Cobble. 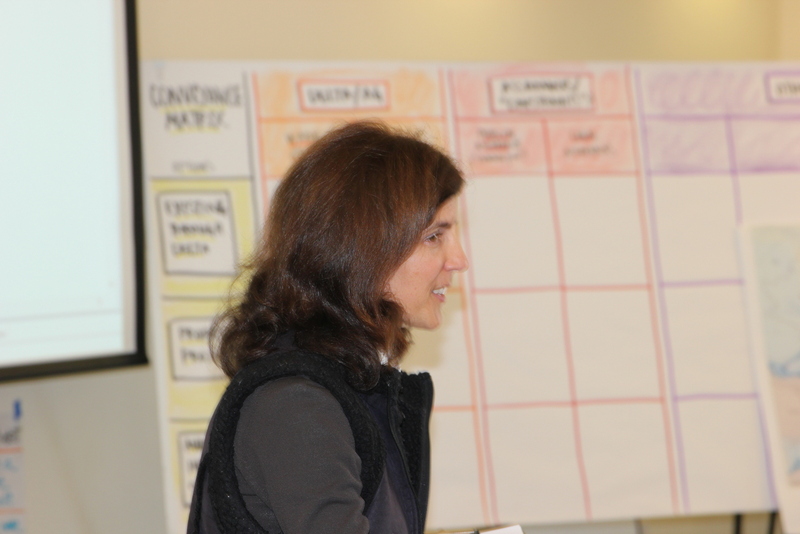 She then led an exercise in which participants used post-it notes to answer seven questions arrayed on easels around the room. 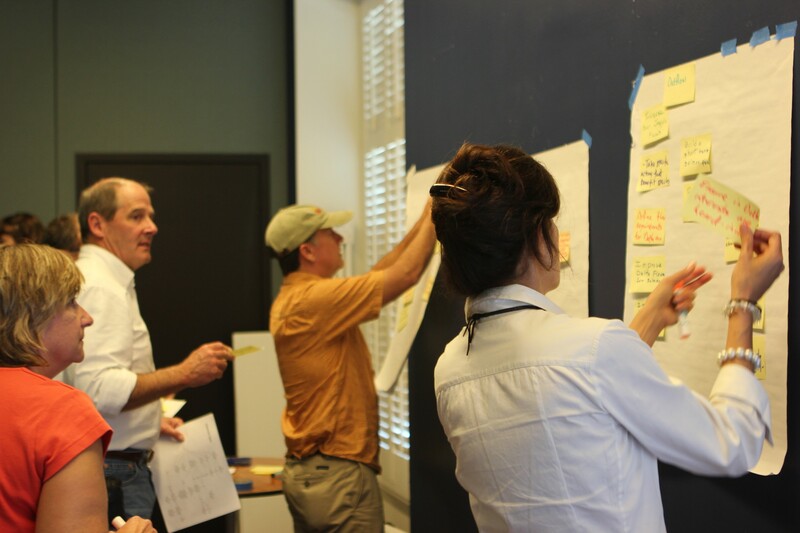 Those questions – and those post-it note/answers – were designed to assess the extent to which participants, after two years of meetings, had made progress and found common ground. The questions and answers, participants said, were to inform a letter from Dialogues participants that would be drafted in March and sent to state leaders and the public. At the beginning of the second phase of the Dialogues last spring, participants had set the goal of communicating the work of the Dialogues to the public, with the goal of influencing public knowledge and ongoing policymaking. But there has been no official communication between the Dialogues and the public. A letter – which the participants said would show how the participants had built trust and communicated well, and exported what they learned and agreed upon as a group – would fill that void. As they discussed the letter, discussion focused on the fourth of seven questions: Where has common ground been found among the participants? 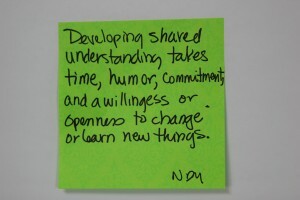 The answer involved the value of a process like the Dialogues, that includes diverse stakeholders, including those excluded from other processes, and that has ground rules designed to encourage listening, thinking, and conversations that produced deeper, shared understanding. 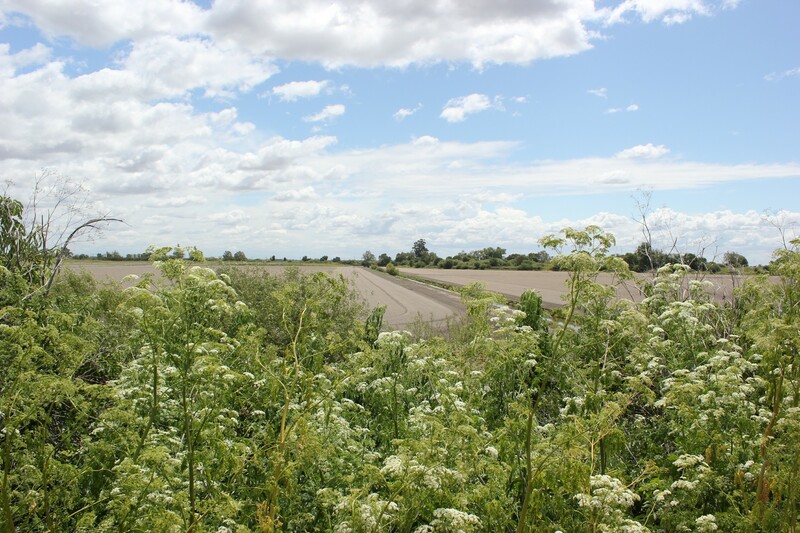 The common ground included broad agreement that questions still need to be considered around the possibility of including hybrid conveyance with an intake in the Western Delta. 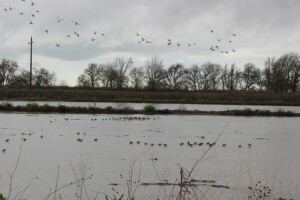 The interest in the Western Delta was related to the shared understanding that there is a need for physical assurances in the Delta, in part because the trust of stakeholders – from Delta residents to water contractors – had been broken in the past when promised projects and benefits failed to materialize. 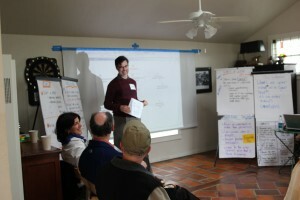 Other points on which participants had found common ground, by their own account: the need for the improvement of the Delta ecosystem, the risks of silver bullet and “mega” solutions; that compromise and collaboration are needed; and that trying to envision a future Delta could be the path to more common ground. It wasn’t clear if the letter would be signed or exactly what form it would take. (Your storyteller was asked to help draft it). Steve Chappell of Suisun Resource Conservation worried aloud that a letter like this could pose risks for participants representing state agencies and perhaps other participants as well. “We have to remember the political risk for not advocating for your group in the letter,” he said. Moderator Kristin Cobble, Contra Costa County Supervisor Mary Piepho, and Paul Helliker of DWR also had an exchange over whether the letter should include calls for more transparency. Helliker said that he didn’t understand the objection to BDCP’s transparency – given all the many different versions of the BDCP documents that have been publicly released and the hundreds of public meetings held throughout the Delta and elsewhere. Piepho countered that the mass of material was hard to navigate, and Cobble pointedly said in response that transparency had to be married with participation by stakeholders. Assessments of the process were positive, though facilitator Conklin, in his concluding remarks, criticized himself for three “failures”. 1. The fact that the work done in the dialogues had not gotten out and noticed in the legislature and to the public. 2. The lack of continuity in the group, as participants came and went through Phase 2, and the resulting difficulties with continuity. 3. 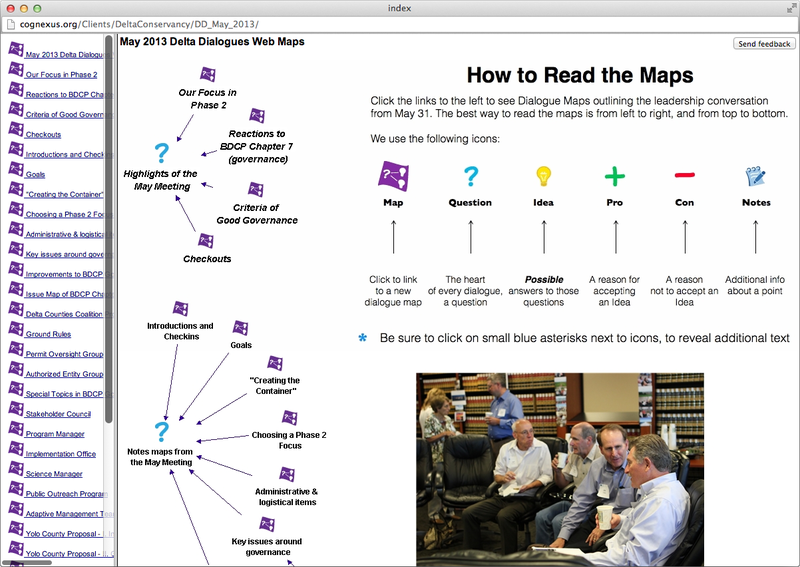 The inability to get the most of dialogue mapping process that mapped the conversations throughout the meetings. Attendance was an issue for the February meeting. There were no Delta farmers or exporters, in part because some were called away to an emergency meeting on the drought. 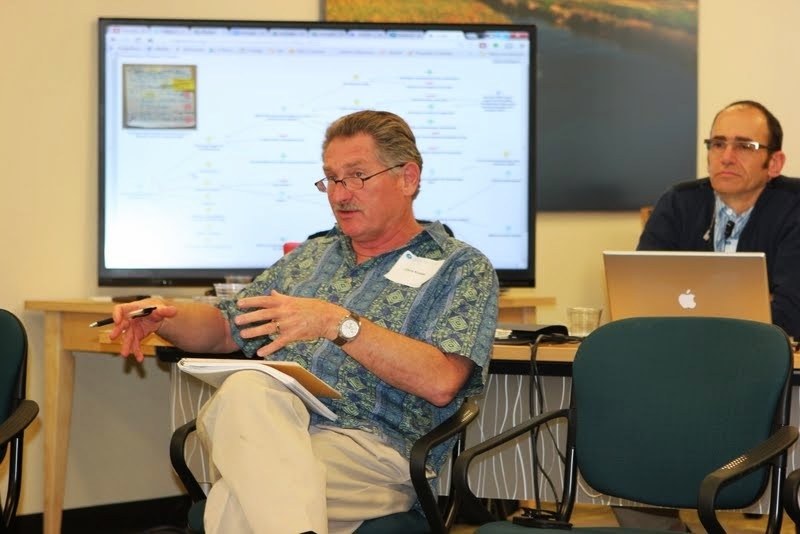 The participants also made a list of topics and questions for more study as the Dialogues continue—questions that ranged from porous levees and the possibilities of a West Delta intake, to questions of overall water supply, to the management of groundwater. 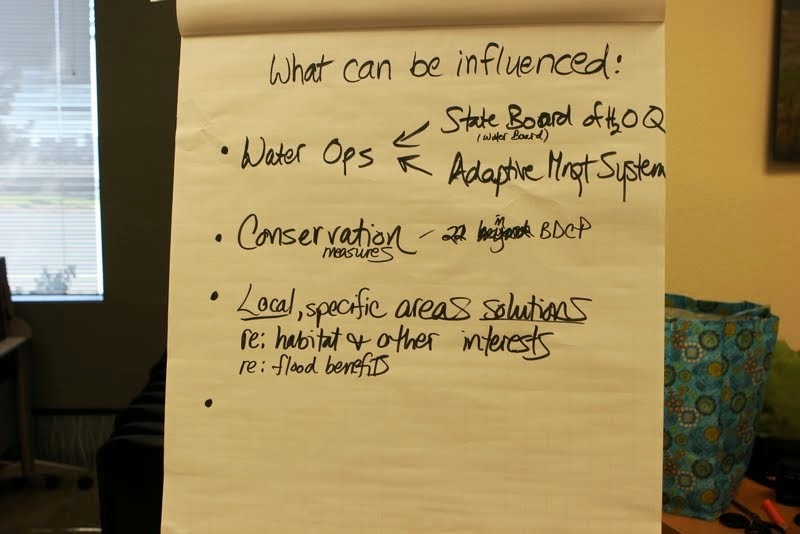 One line of questions involved how to reconfigure the BDCP to provide physical assurances to stakeholders, reduce the impact of conveyance on the North Delta, and provide sufficient flow for fish and people. Delta Dialogues participants, gathered at a hunting club on the Rindge Tract outside Stockton, spent their November session doing some hunting of their own, seeking deeper understanding of alternative conveyances and listing their own criteria for BDCP and other Delta plans. 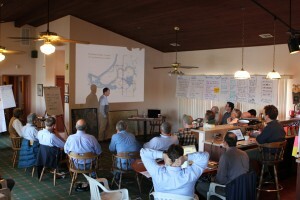 It was the third straight Delta Dialogues meeting to involve detailed examination of “Multiple Intake Scenarios,” with the diverse group of stakeholders looking at possibilities that might include an intake on the Western Delta and alterations to the BDCP’s proposed intakes in the north of the Delta on the Sacramento River. Some participants also held a phone meeting Nov. 6 to examine aspects of a Western intake, including the impact on the Delta smelt. The November session of the dialogues, at the Rindge Tract Partners hunting club of Delta landowner and Dialogues participant Tom Zuckerman, felt like an unpromising end and a promising beginning. 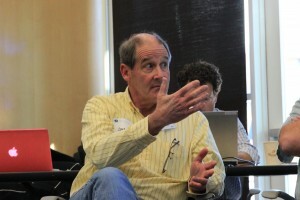 The unpromising end came first, with John Cain of American Rivers summing up the phone call and participants appearing to have deeper understanding of why a Western Delta intake would not be a viable alternative (although Zuckerman pointedly said he wasn’t giving up on the idea; a “porous” levee could work and a Western facility might not impact smelt if it’s operated during higher flows, he said). 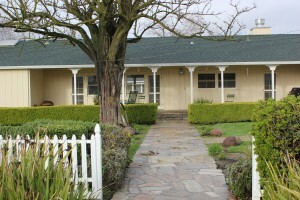 The promising beginning started in the late morning, and continued into the afternoon – as the conversation switched from the particulars of conveyance alternatives to a conversation about the criteria for Delta plans. The switch was made when facilitators asked about the criteria that drove the BDCP – and what criteria should have governed any such plan and weren’t used. 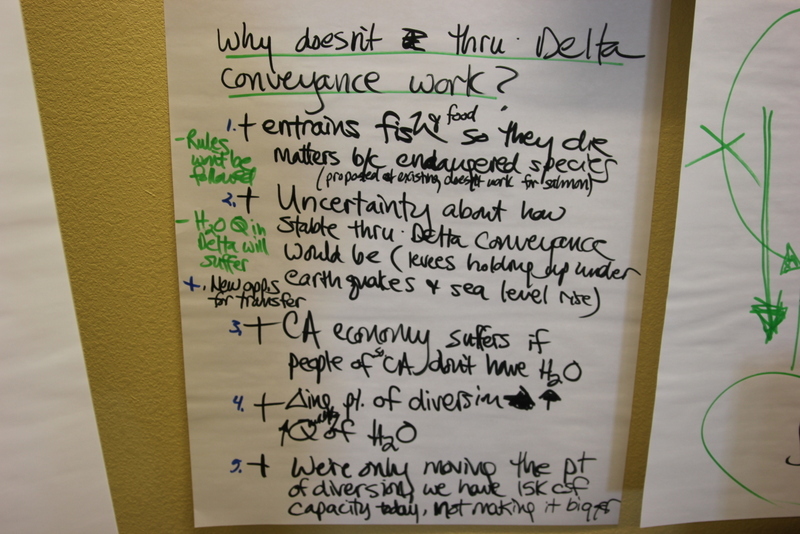 While the conversation about conveyances hadn’t produced an alternative plan from the Dialogues participants (as some said they had hoped), that conversation seemed to have deepened understanding about what the criteria should be for any Delta plan. 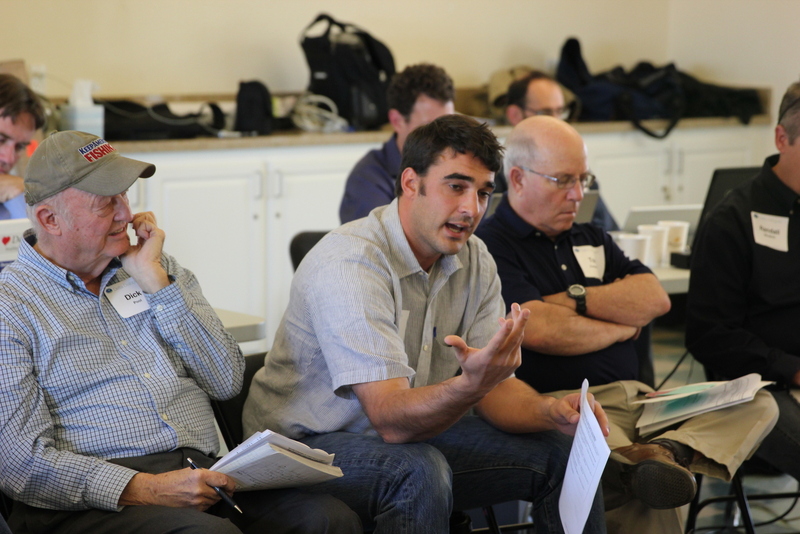 Participants listed a variety of criteria, often by listing criteria they didn’t see being met by BDCP: covering the goals of habitat restoration and water supply, limiting the risks that often result from mega-projects, limiting the impact of tunnels on the Delta, considering the Delta as a place with its own interests and needs, trying to find ways to create more water for the Delta’s various stakeholders, and creating greater clarity about terms and governance in the Delta. The conversation was wide-ranging, and focused particularly on the need to contain risks, perhaps through physical barriers, to the Delta and its economy. Participants said that the alternative criteria they were listing could be brought to bear on BDCP and other Delta plans. 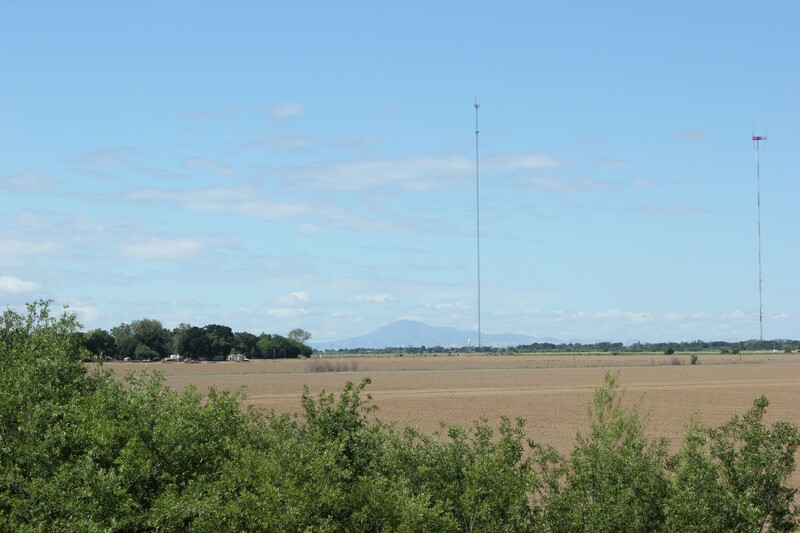 In response to a conversation about how much agricultural land in the Delta might be lost under the BDCP proposal, participants discussed holding a follow-up meeting, perhaps by phone, before the next regularly scheduled Dialogues session in January. Leo Winternitz of the Nature Conservancy said he thought such a session would be useful, in his view, because comments by North Delta farmer Russell van Loben Sels about the loss of agriculture for habitat were overstated. “It will alleviate some fears and we’ll all come out with a better understanding,” said Winternitz. Participants also said they could have a sub-group to look at another alternative conveyance, though not in the Western Delta. Instead, they might consider a reduced North Delta diversion in combination with conveyance through the Delta corridor. Only two more sessions of the dialogues are currently scheduled – for January, and then either February or March – and funding beyond that is uncertain. 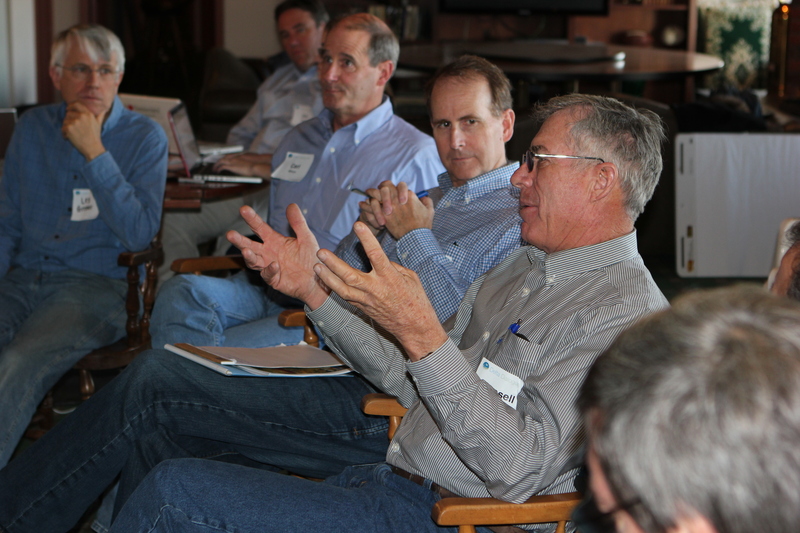 Participants said they appreciated the Dialogues’ work so far – especially its record to create greater understanding and a record of the path to such understanding – and believe the process could do more, including advancing specific proposals and having more impact on the growing public debate over the BDCP and the Delta’s future. The challenge for the Dialogues is how to get there. 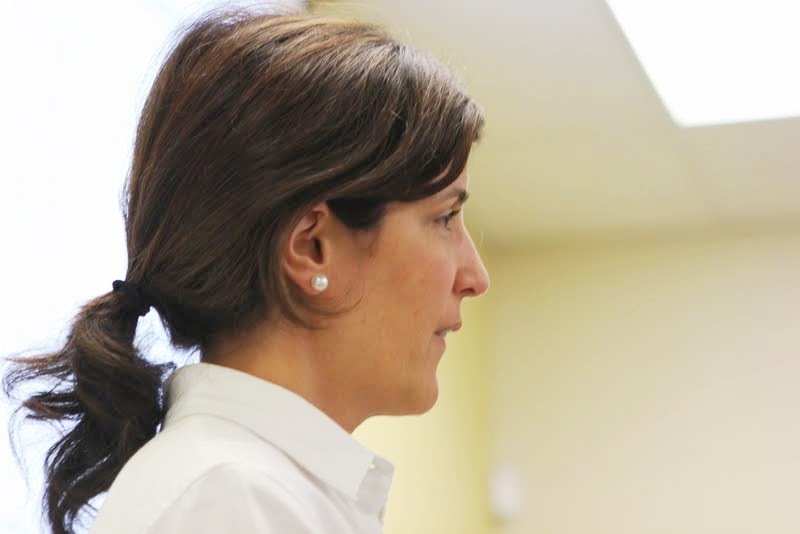 “I think it’s a good process, but I don’t understand what the result is,” said Winternitz. 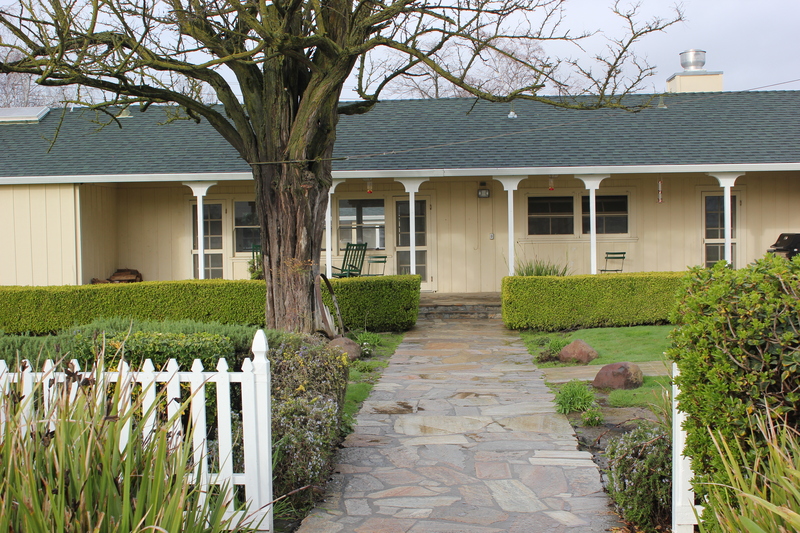 “I share Leo’s mystification about how can we take this good will, this willingness to understand… and convert it into something that is real,” said Jason Peltier of Westlands Water District. 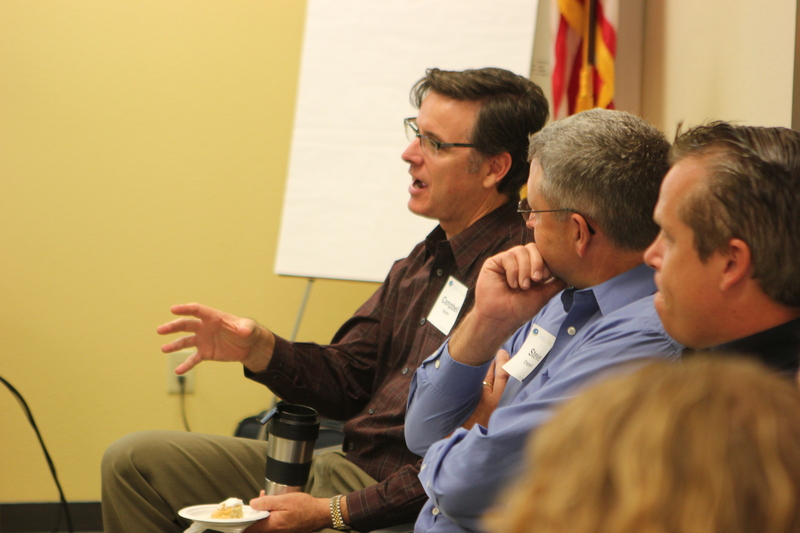 Participants said there were other conversations taking place in the Delta, perhaps too many. “I’d be happy to have twice as many meetings with half as many groups,” quipped Zuckerman. 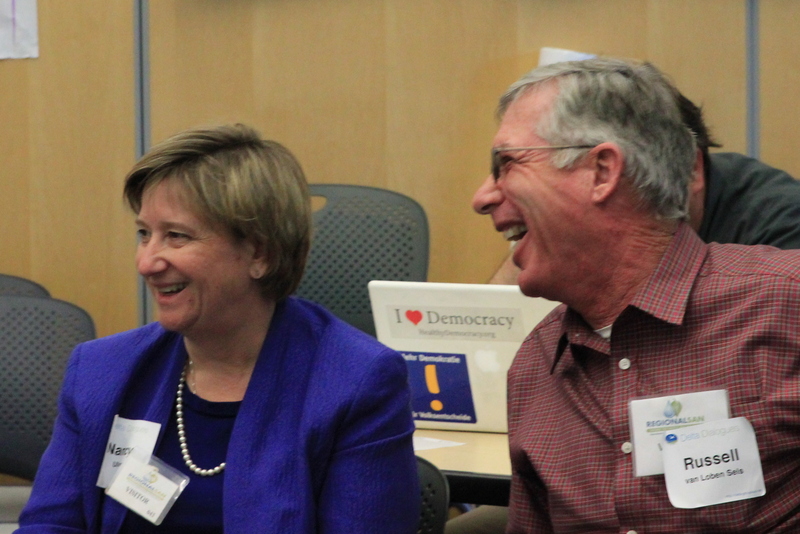 Participants also said they’d like to see more participation from government – particularly federal and state agency officials and local county supervisors who are part of the Dialogues, but did not attend November’s session. 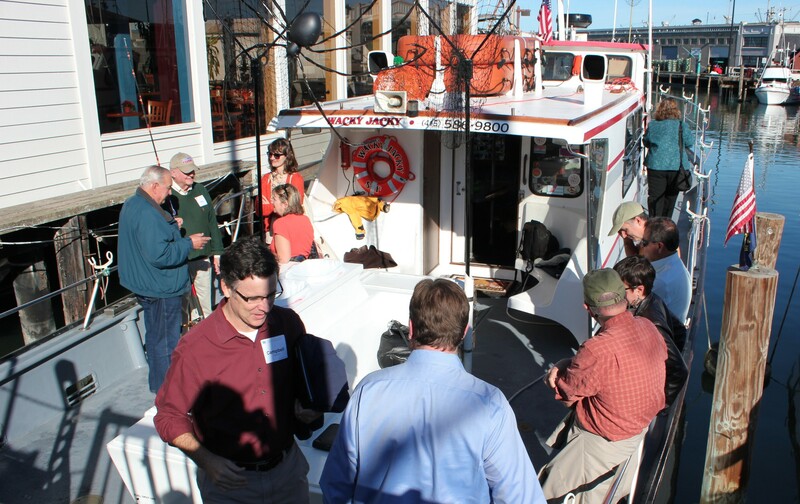 Taking what felt like a deep breath after tough recent meetings in Sacramento-area offices, the Delta Dialogues and its participants returned to the outdoors and to a discussion of alternatives to the Bay Delta Conservation Plan conveyance proposals during their October session. 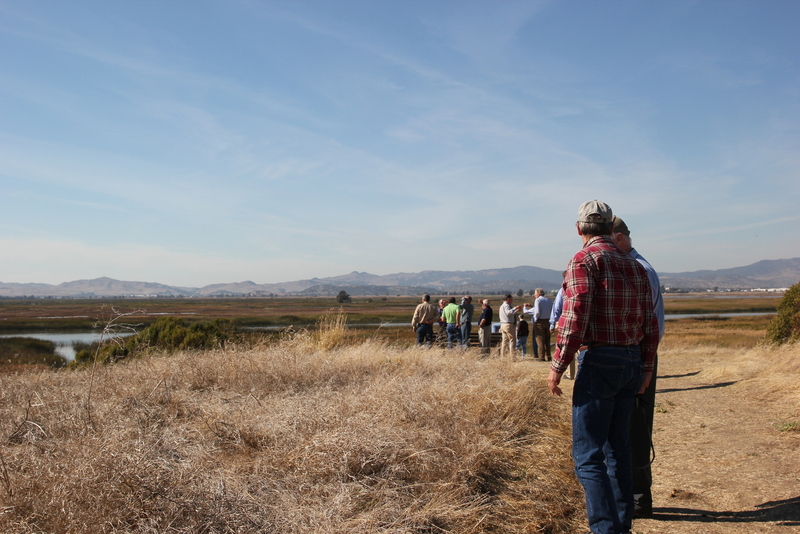 The daylong gathering at Rush Ranch, in Suisun Marsh, was among the best-attended sessions of the dialogues, with representatives from every stakeholder in attendance. Jerry Meral, deputy secretary of the California Natural Resources Agency, also attended and participated in the meetings. “I’m happy to be in the marsh. 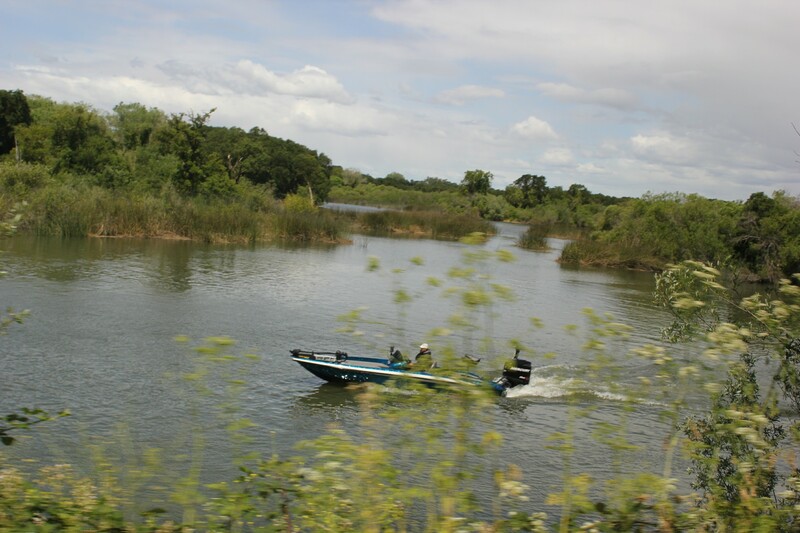 It’s a lot closer to home, back in the natural world,” said Carl Wilcox of the state Department of Fish and Wildlife early in the meeting. 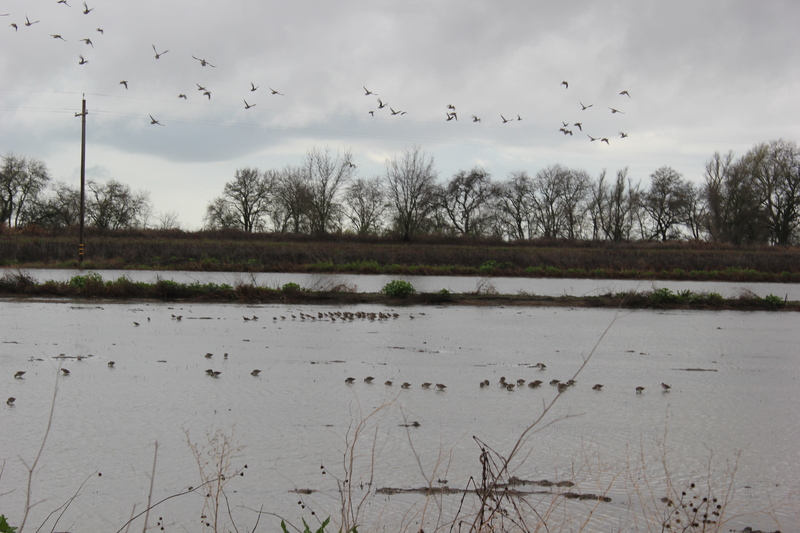 Delta landowner Tom Zuckerman, noting the fall harvest and presence of ducks and geese in the Delta, said he felt optimism, and not just because the time of the year. “I sense the discussion is beginning to open up at long last,” he said, adding that in-Delta stakeholders are beginning to have their concerns heard in debates about the future of the Delta. 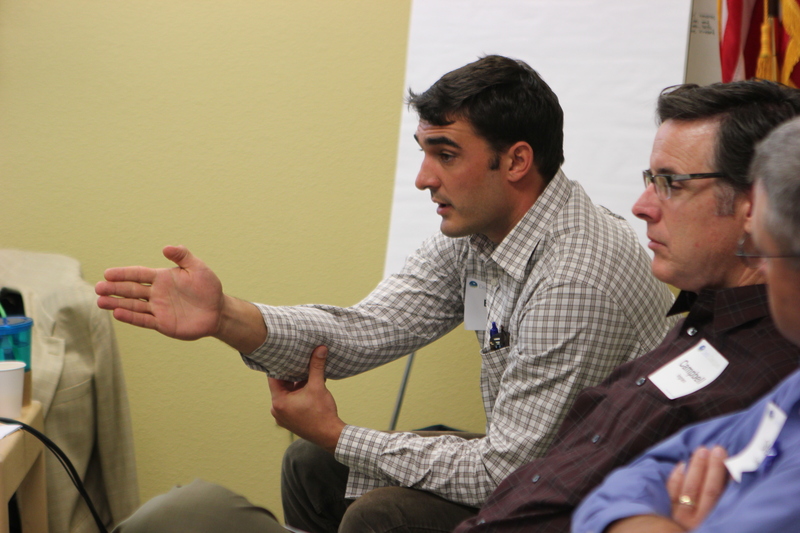 The conversation again centered on possible alternatives to the BDCP conveyance, especially the possibilities of multi-intake scenarios that could involve the Western Delta, and the discussion was often difficult, technical and frustrating. John Cain of American Rivers and Jason Peltier of Westlands Water District complained at different points in the day that time was being wasted. To help things along, facilitator Kristin Cobble, who returned to the dialogues after missing the September session, handed out a picture of a rabbit disappearing down a hole to each participant, and instructed participants to wave the pictures above their heads if the conversation was “going down a rabbit hole.” The rabbits were employed only a handful of times. 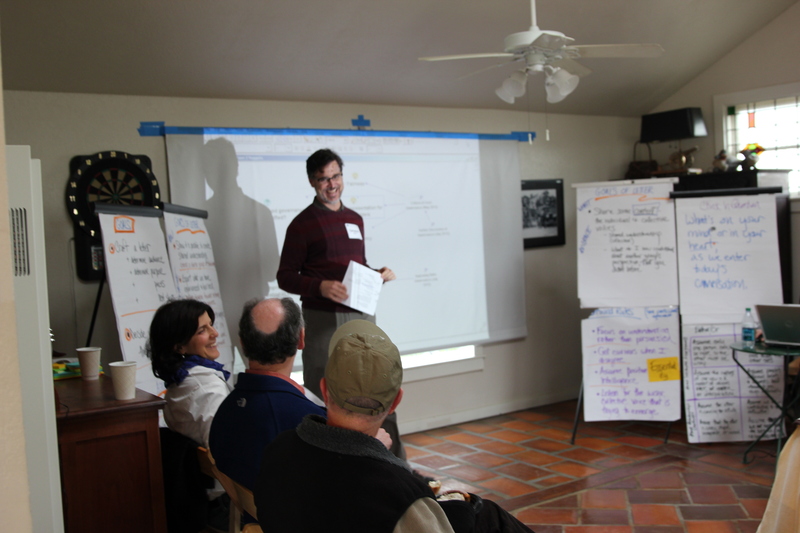 The facilitation team also spent considerable time reviewing the rules and practices of the dialogues. In this year’s second phase of the dialogues, nearly half of the participants are new additions who did not participate in last year’s first phase, and facilitators and participants have said it’s important to “strengthen the container” – the metaphor they often use for the dialogues as a contained, safe space where difficult issues can be discussed and understandings reached. 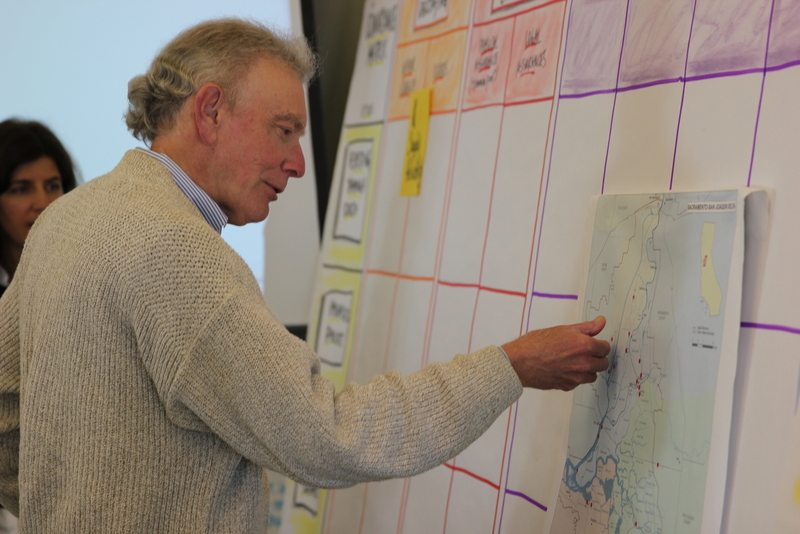 Newer participants were asked to point to their favorite place on the Delta on a map, and in one exercise, all participants were asked to identify things the group had in common. “We all want to protect the Delta,” was the first. “We all go to a lot of meetings,” was the second. After that container-building, the day broke down into four sections. 1. In the late morning, Gwen Buchholz offered a presentation and answered questions about the various alternatives to the conveyance alignments in the BDCP. She described a painstaking multi-year, EIR/EIS process (it took over a year to develop screening criteria, she said) that started in 2008 and is still ongoing. It did boil down many ideas to 15 conveyance alignment alternatives. Find a description of the process here, then an initial screening of alternatives here, and a secondary screening here. 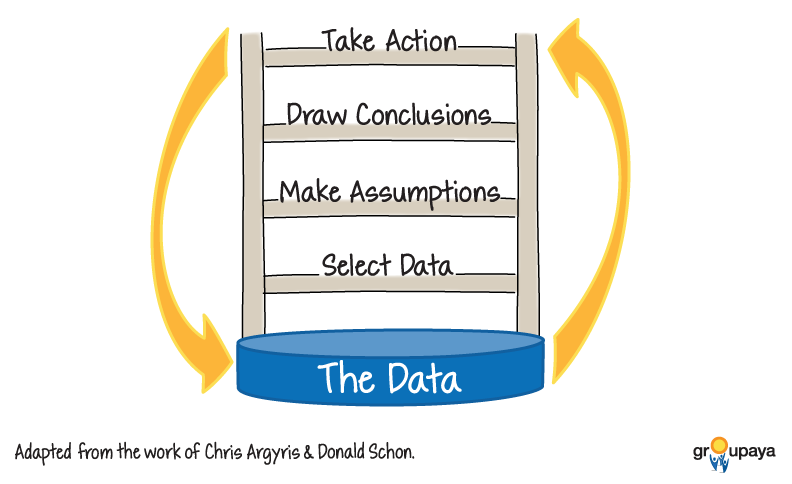 She noted the complexity; it had taken her four hours, she said, to boil down the 200-page appendix explaining the process into a presentation. Despite all the things considered, participants asked about whether variations on some of the alternatives had been considered, or whether combinations of alternatives had been considered. The answer in some cases was no, with Buchholz noting that not every conceivable alternative could be studied and that she and colleagues in other agencies had relied heavily on public comments in the process. They had to answer questions they were asked, she said. One takeaway from the presentation and conversation was that two tests were crucial to screening alternatives. If the fish agencies said that an alternative wouldn’t work for species, it didn’t have a chance. And if contractors said an alternative wouldn’t work economically, it wouldn’t have a chance either. Several participants, including Meral, emphasized that the alternatives conversation was important and was continuing. If there’s something better that meets the variety of tests necessary for conveyance, it could be useful. 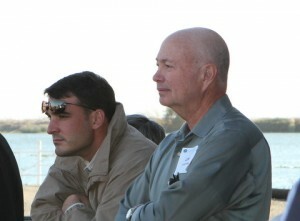 Paul Helliker of state DWR said that viable alternatives could come up late in the process. 2. Following from this conversation, the conversation entered the matrix. Literally, facilitators in collaboration with Cain and Chris Knopp of the Delta Stewardship Council had created a matrix for evaluating and understanding three conveyance possibilities – status quo, the current BDCP proposal, and a multi-intake alternative – on a variety of criteria and questions. The matrix filled two large boards on either side of the screen upon which the conversation was being mapped. But they only managed to fill in one column of squares on the big matrix. 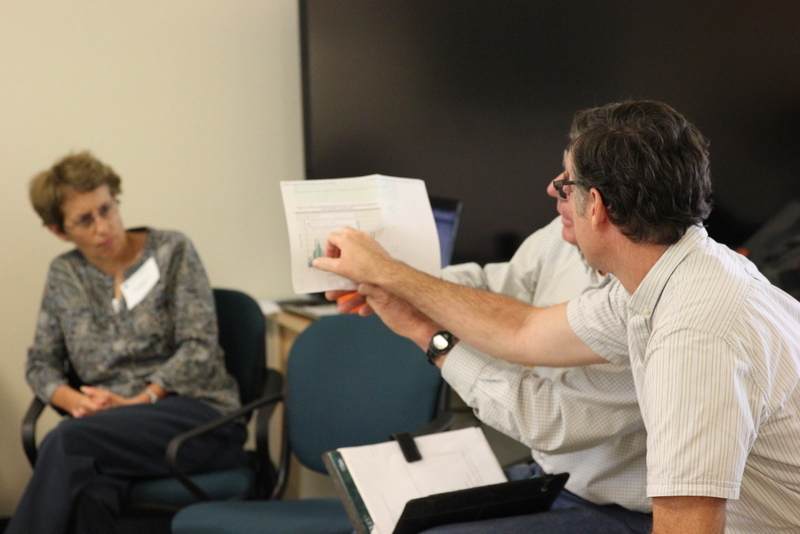 The conversation was detailed, but participants struggled to define terms and decide questions. Several complications were introduced into the process, involving the differences between wet and dry years, and the ability to draw more water in storms. 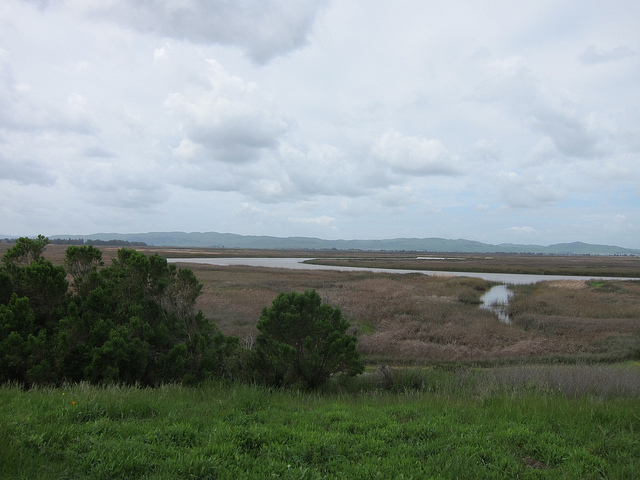 Forty minutes were allotted for lunch, but the group decided to go for a walk into the marsh, and it took more than an hour. 1. What is the largest physical facility in Western Delta that In Delta stakeholders could support? 2. Can In Delta stakeholders live with any North Delta diversion at all? 3. 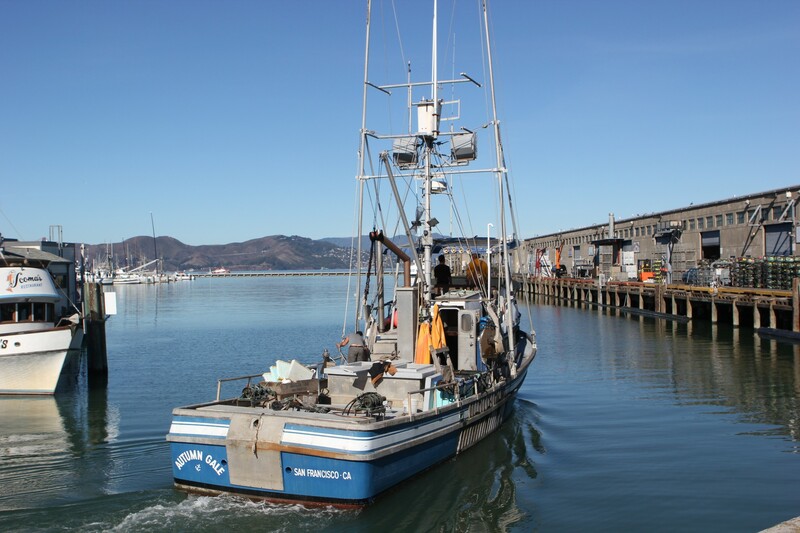 Can the facility be permitted by the fisheries agencies, and would the water contractors be willing to finance it? The two in-Delta interests — North Delta farmer Russell Van Loben Sels and Zuckerman – both said it was possible to conceive of plans and operations that could be supported, though it would not be easy and the details would be crucial. 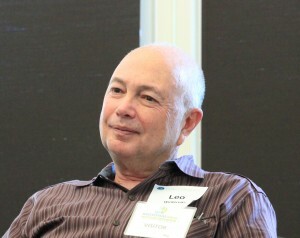 Van Loben Sels said it was important that any alternatives make as little change and have as little impact as possible. Zuckerman emphasized the importance of having a “firm linkage” between “new dry period yield” of water north of any diversion facility and the operation of such a facility. That precipitated a conversation, including Wilcox, about how to find out more about the impact of a Western Delta diversion. That led in turn to conversation about arranging a meeting or phone call, involving some participants and non-participants, including federal fisheries agencies, to look at the Western option (including impact on fish, questions about where facilities can be located and their size) before the next Delta Dialogues session on Nov. 15. 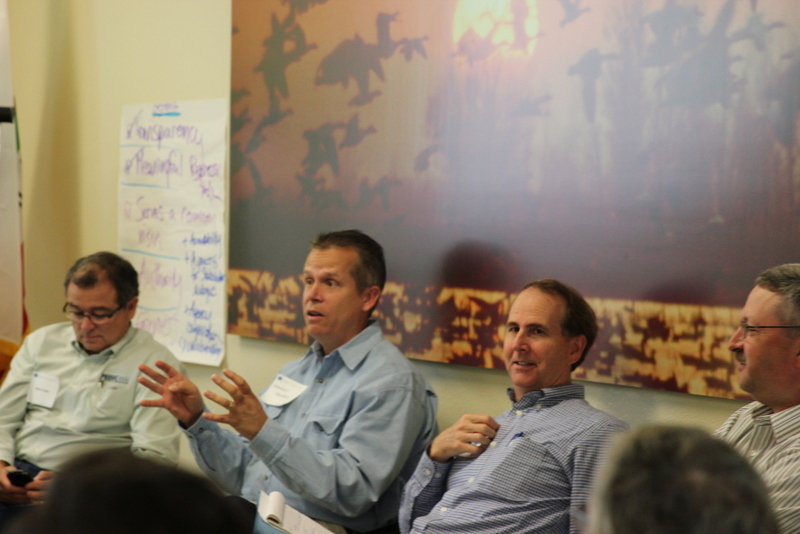 In closing, facilitators asked two questions: what was most valuable about the day’s discussion? And what question do you most want answered or explored on Nov. 15? 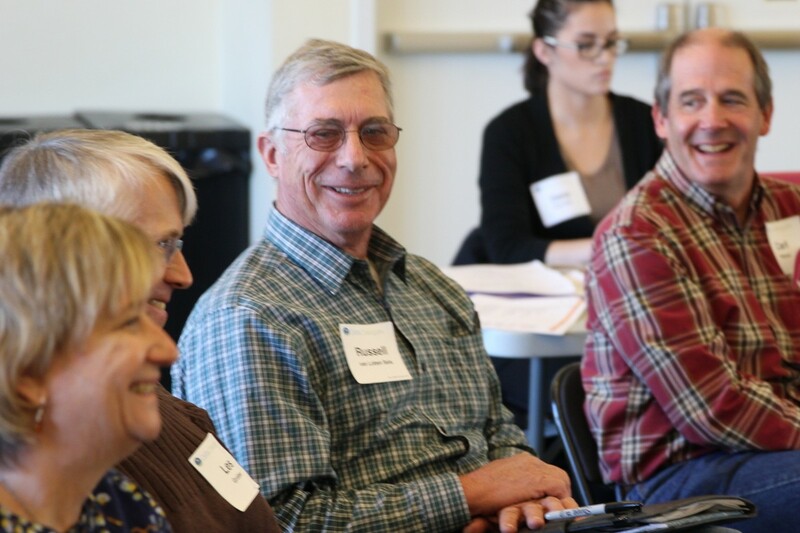 In response, members talked about various questions around alternatives, though participants suggested that they needed to come together on specific, simpler questions to drive more productive discussion. Are the Delta Dialogues Stuck? 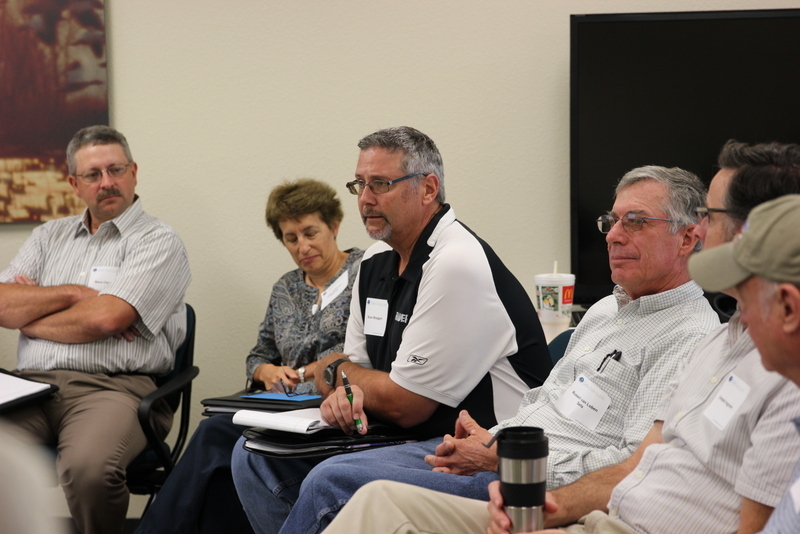 It looked and sounded that way at September’s gathering of the process that involves a diverse array of stakeholders from around the Delta. 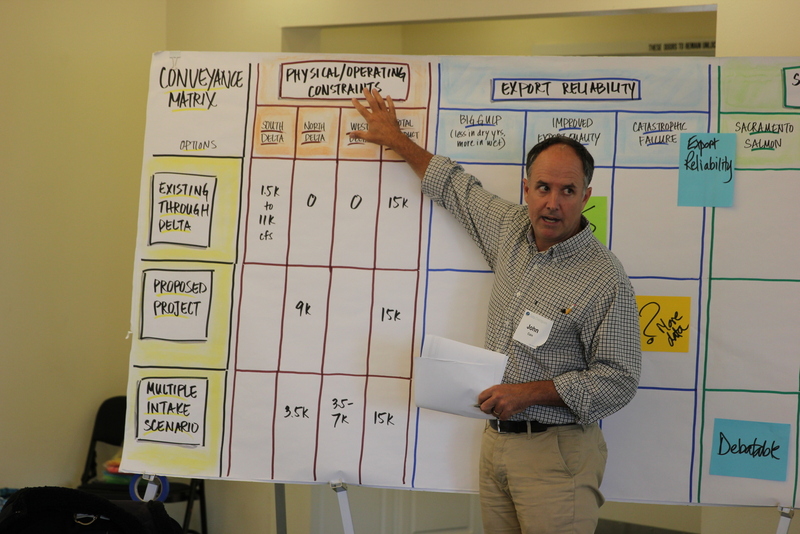 After a year and a half of sessions that participants had called productive, the September session left participants frustrated and questioning the process. The daylong gathering at the Delta Conservancy included testy exchanges, early departures by a handful of stakeholders, side conversations while others were speaking, the failure of participants to stick to the agenda, and difficulties and miscommunications among the facilitation team. For the first time in the 18-month-old process, one participant, declined to say anything during “check in” process that starts each meeting, a simple, often lighthearted exercise in which participants are asked to say a few words about how they’re feeling as the meeting begins. 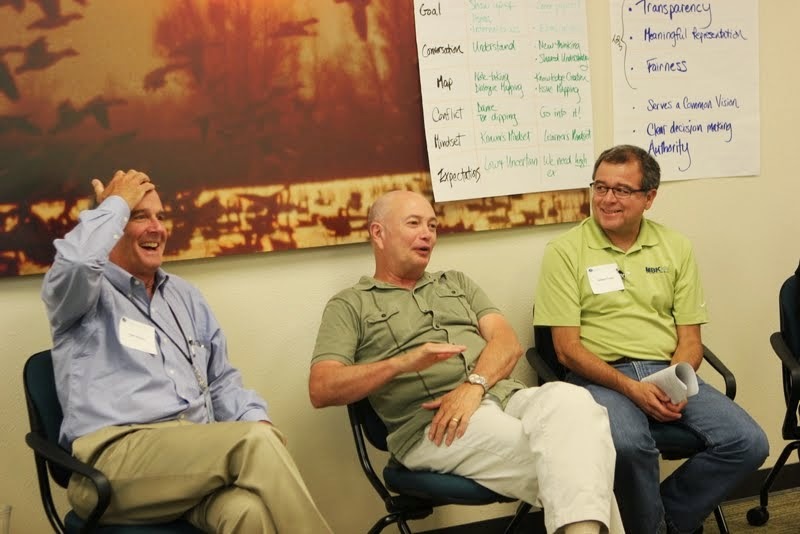 The group spent much of the time debating what they wanted to talk about – water supply? Conveyance? Undoing constraints in the system? A sequenced approach to the BDCP? Management of water? A Western Delta diversion, perhaps with a permeable levee? This tug of war over the agenda represented a reversal from the previous meeting in August, when the group seemed to have agreed to look at hybrid alternatives to the BDCP conveyance plans. The battle over the agenda did in fact touch on many of these alternatives, but as they jumped between technical details and other subjects, the conversation came at an unusually rapid speed for a dialogues process that often is slowed so that the statements of participants can be mapped on a screen. Participants frequently interrupted each other. The resulting conversation was scattered, and facilitators struggled to map it. By meeting’s end, participants seemed frustrated and beaten down. 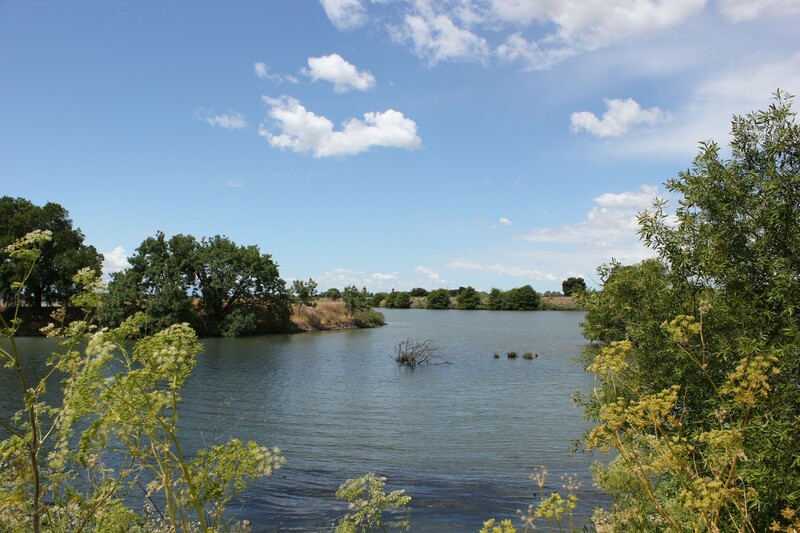 “I think we need to shake it up,” said Jason Peltier of Westlands Water District, suggesting a return to field trips into the Delta that were a staple of the process’ first phase in 2012. 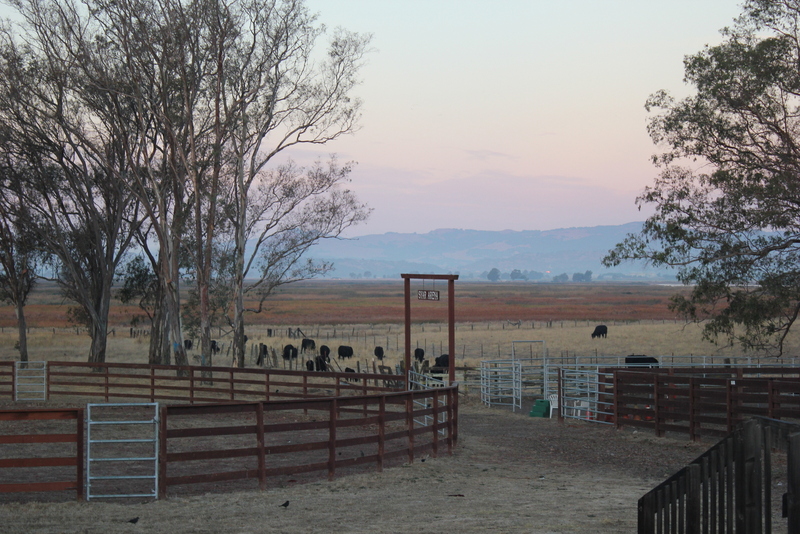 “Today’s discussion was a little frustrating,” added Russell van Loben Sels of the Sacramento County Farm Bureau. But participants said they remain committed to the Dialogues, and wanted to continue to find ways to continue the Dialogues and examine alternatives to the current conveyance and BDCP plans – both to achieve shared understanding and perhaps suggest changes to existing plans. Facilitator Jeff Conklin told the group that, at the end of the August meeting (see “Forging Common Ground“), it appeared that the group had reached “a critical transition,” where there was enough trust to talk about the messy details of conveyance and alternatives. In September, he said, that conversation “happened, but it wasn’t full of the balloons and whistles that I thought might come of it… It was a drill down into the contested points of view.” At the end of the meeting, he noted that polarization had come out and thanked the group for its persistence. One factor appeared to be the number of relatively new arrivals to the Dialogues among the participants. Seven of the 17 were either new or had not participated in last year’s Phase 1, when the group built trust and relationships with the goal of permitting difficult conversations. 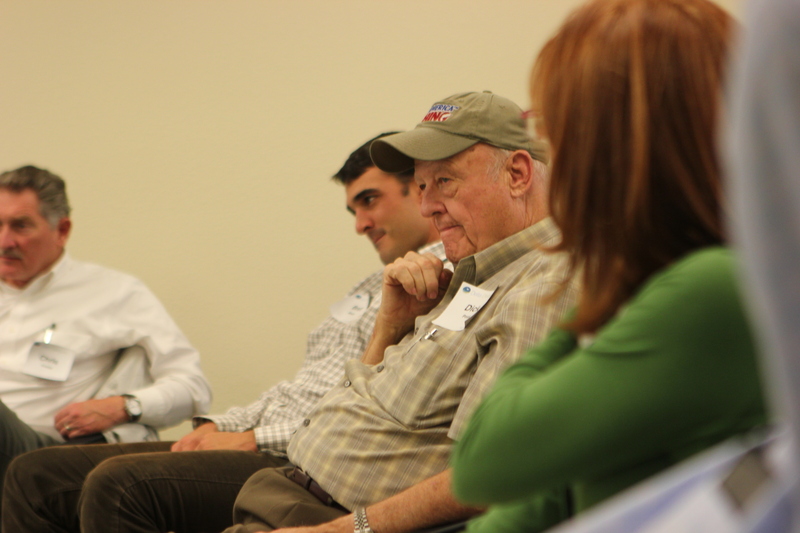 At September’s gathering, much of the conversation consisted of longtime participants trying to slow down conversation and explain to newer participants how the dialogues worked. But the participants had little help from a facilitation team that was short lead facilitator Kristin Cobble; Cobble and Conklin had previously facilitated the meetings together, but the two had agreed to begin alternating, with one facilitating and the other skipping the meeting, in order to save money and permit Dialogues meetings to continue longer, into next year. (The Dialogues, through the conservancy, are seeking funding for more work and meetings in the future). Carl Wilcox of the state Department of Fish and Wildlife stood out for striking a rare positive note at the end, saying that the conversation about an alternative diversion in the West Delta, in combination with a smaller North Delta diversion, had given him hope about the conversations. “Certainly I will be talking to Randall and John and others about how that might work,” he said, saying that analysis could generate relevant information for BDCP. “I am somewhat encouraged,” he said. The session prompted facilitators to do some deep self-examination, and scramble to re-examine the Dialogues and their plans. They said that, in the days after the September session, they would reach out to participants personally. The Dialogues appeared headed toward some kind of shake up. But the nature of the shake-up was unclear. “I’m still pissed off,” quipped Jason Peltier. The room laughed. For this was the beginning of the first meeting of the second phase of the Delta Dialogues, and the tone of Peltier, the chief deputy general manager of the Westlands Water District, which hosted this gathering, was light-hearted. The dialogues were getting back together again. 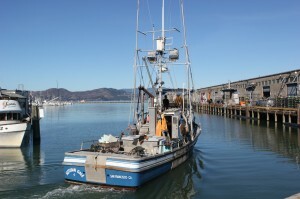 Dialogue participants had been talking (and even met to plan a second phase in February), but it had been seven months since the last official meeting of the dialogues, last October in Fisherman’s Wharf. But it was clear that the group – representing a diverse array of Delta interests (agriculture, state agencies, the federal government, local government, fishing, environmentalists) – remained comfortable with each other. The conversation was erupted by laughter more than 30 times. 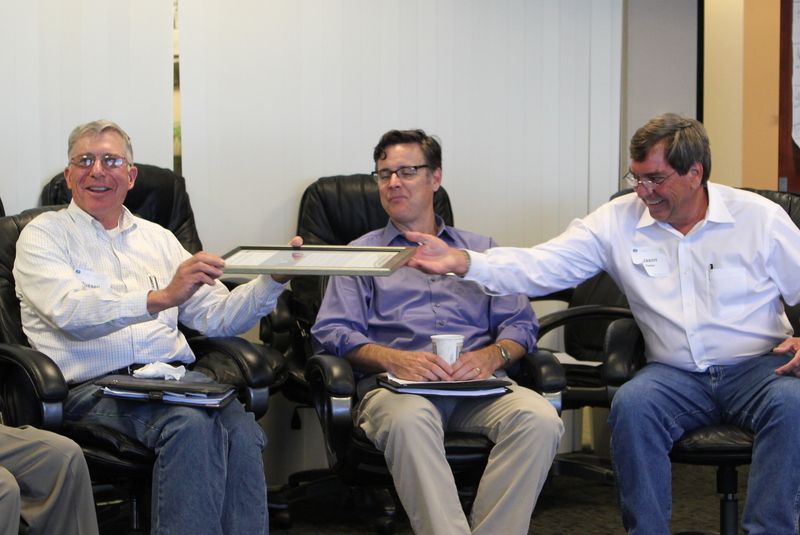 At one point, Peltier presented Delta farmer Russell van Loben Sels, also of the Sacramento County Farm Bureau, with a gift: a framed photo and story of President John F. Kennedy speaking at a dedication for the San Luis Dam and Reservoir west of Los Banos. A similar spirit, and a bit of impatience, infused the meeting, as the advantages of the lasting comfort between the participants were made clear. All the comfort seemed to create more space for conflict – and detailed conversations – than in any previous Delta Dialogues gathering. 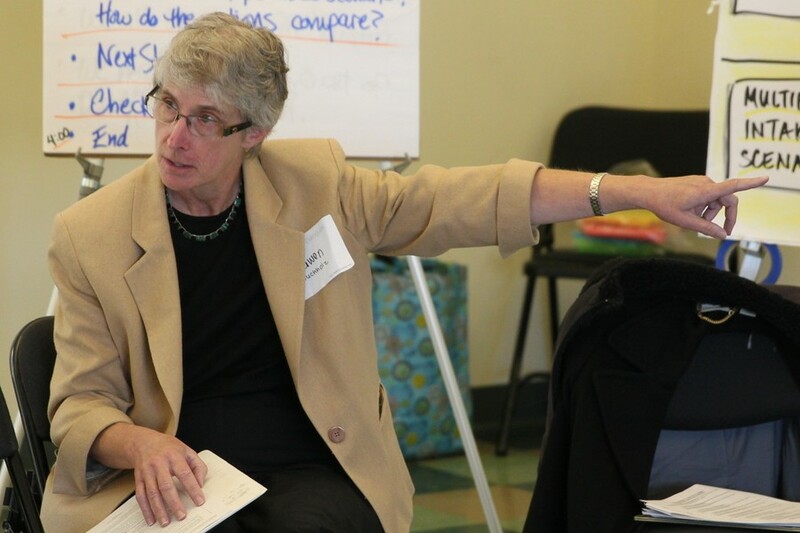 A failure to get into the difficult details and conflict in the Delta – “into the heat,” in the phrase favored by facilitator Kristin Cobble of Groupaya– had been one shared frustration of the first phase. The Phase 1 conversations had built relationships and trust among the participants, but not enough to surmount some of the wariness participants had about conducting frank conversations with people whom they had been fighting (and in some cases suing) for decades. But this time, the group jumped right in. 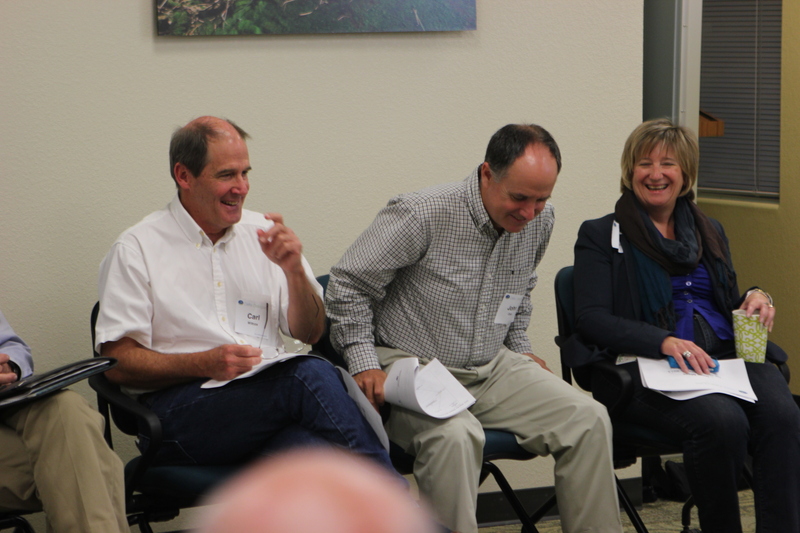 Facilitators’ questions about trusted sources of information on the Delta and about Chapter 7 of the Bay Delta Conservation Plan prompted such detailed exchanges that facilitators had to break in repeatedly to slow them down. The exchange appeared to establish the question of governance – and how to build a better governance regime for and around the Delta – as the central question of Phase 2. Chapter 7 of the BDCP consists of 30 pages of governance. Few words of praise were said about the particulars, with even those who participated in its drafting emphasizing that it could be changed and improved. 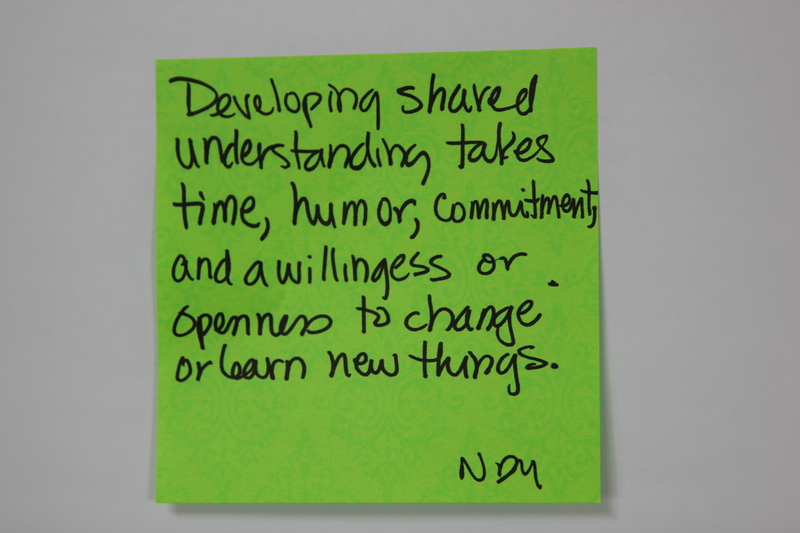 The participants listed and discussed what they wanted to see in a governance plan. Seven principles were discussed. Governance should be transparent, be fair and balance different interests in the Delta, provide meaningful representation for in-Delta interests, especially local governments and farmers that have felt excluded, work incrementally, deter litigation, encourage participation, and create an environment for building relationships. 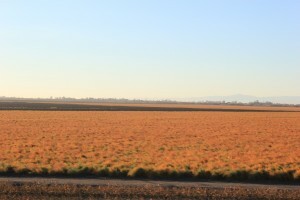 In a couple of key moments, the exchange suggested that government agencies and water contractors could build a governance set-up that could satisfy Delta agriculture and local governments. 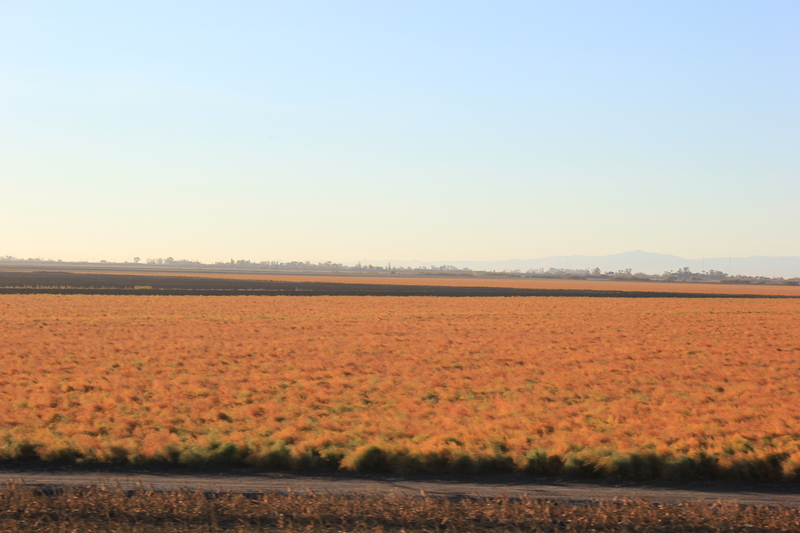 An agricultural stakeholder indicated that a truly balanced governance system could provide reassurance about some aspects of the BDCP, and a state official said there could be changes to give much more of a role in governance to agriculture and in-Delta interests. As evidence of the quality of conversation, in closing check outs, the participants said they were encouraged by each other’s statements. The participants and facilitators also spent considerable time during the six-hour meeting (which included only a brief lunch break) defining the goals and focus of Phase 2 – mostly in opposition to Phase 1. 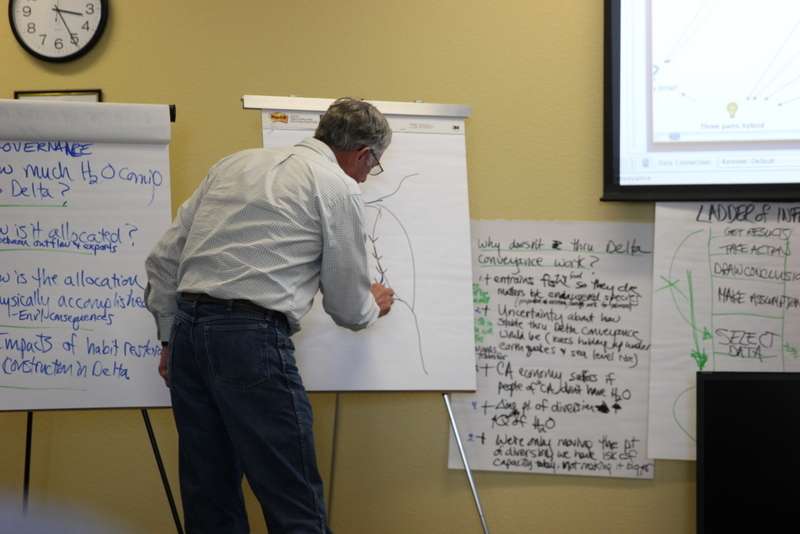 Using a flip chart, Phase 1 was defined as creating shared understanding and strong internal dynamics between the dialogues participants. In Phase 2, participants said they wanted to produce a work product that could make an external impact and be published. The participants and facilitators discussed how the maps of the discussion, which are filled out in real time in front of the participants as they talk, could become a published document; in Phase 1, they had been used more as a note taking method. The first meeting of Phase 2 also included two new participants in the dialogues, who appeared to warm to the conversation as the day went on. 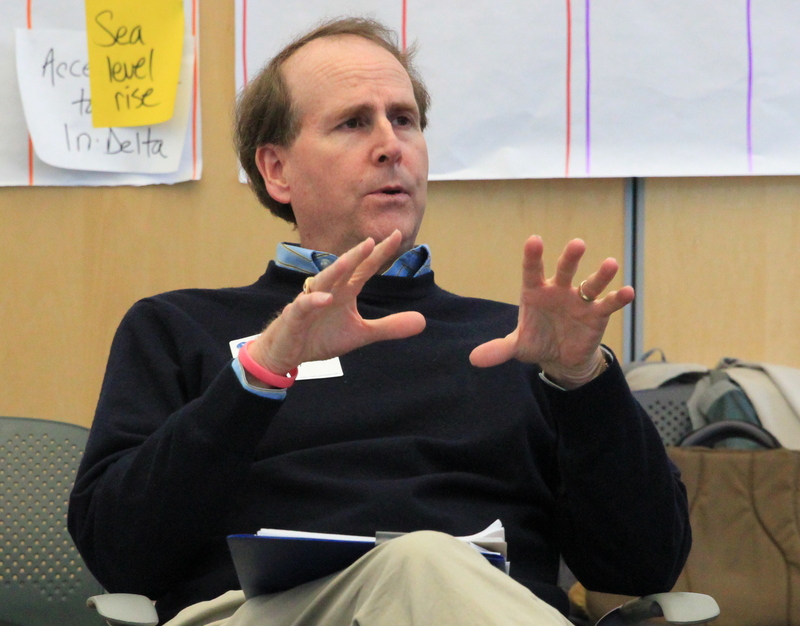 Steve Chappell, executive director of the Suisun Resource Conservation, began the day striking a skeptical note about “lofty goals” and “global discussions” in the context of a Delta where big change is often unattainable. 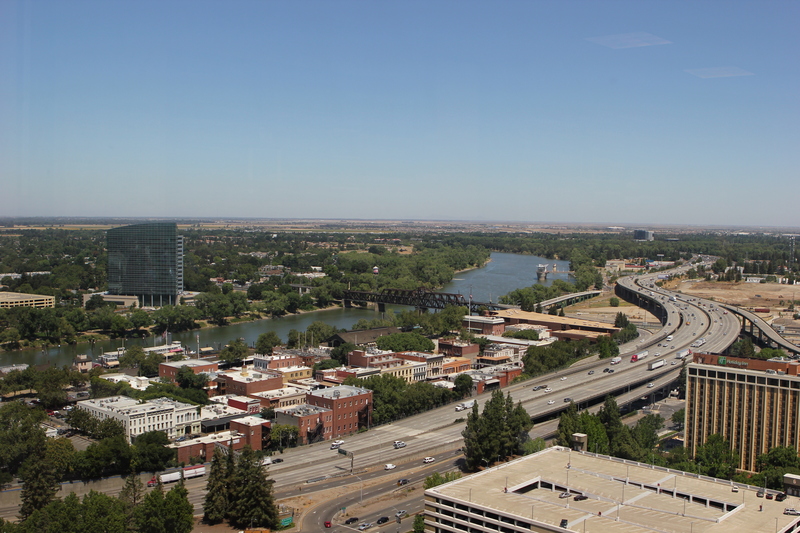 Chris Knopp, executive officer of the Delta Stewardship Council, expressed similar skepticism. 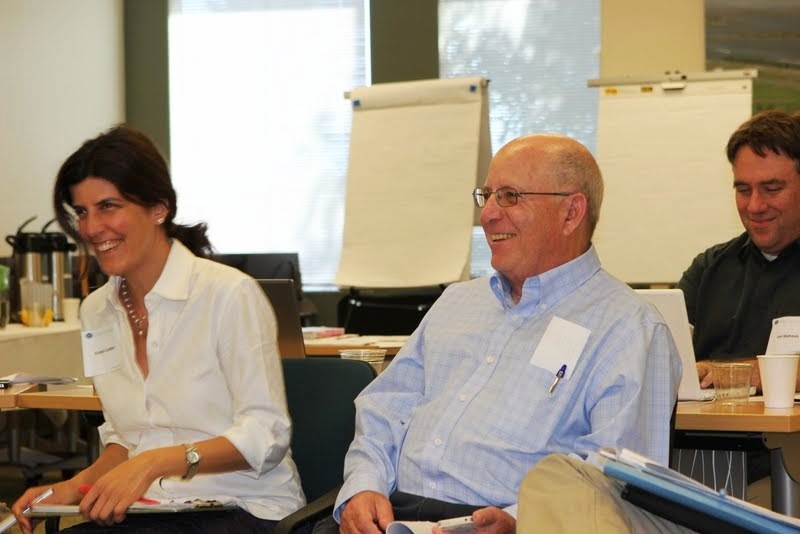 But after a long day of conversation, they were optimistic in their closing comments, with Knopp calling the discussion “very enlightening” and said it had “opened up some thoughts on how to make some improvements” in how stakeholders participate in the implementation of the Delta Plan. Dialogues participants said they intended to meet monthly. During the intervening seven months, participants had found funding for six months of gatherings – half of the planned Phase 2. Facilitators said they were training Campbell Ingram and Nancy Ullrey of the Delta Conservancy so they could lead sessions themselves in the future.